Elephone is not one of China’s well-known smartphone makers, but this didn’t stop the company from announcing a unique handset called Elephone P5000. Far from being unique when it comes to design (it looks too much like a Samsung Galaxy), the Elephone P5000 is special because it packs a 5350 mAh battery - the largest ever included in a smartphone. The previous unofficial record in this regard was set by the Philips W6618 and its 5300 mAh battery. According to Elephone, the 5350 mAh battery can provide a usage time of up to 4 days. The battery has a fast charging mode (going up to 70% in one hour), and can be used to transfer power to other smartphones and devices. Despite the fact that it packs such a huge battery, the P5000 is relatively thin, measuring 144 x 71 x 9.3 mm. The handset runs Android 4.4 KitKat, and can be considered a typical high-end Chinese smartphone. Its features include a 5-inch 1080p display, fingerprint scanner, NFC, an 8 MP front-facing camera, 16 MP rear camera, 2 GB of RAM, and 16 GB of internal memory. The phone is powered by an octa-core 1.7 GHz MediaTek MT6592 processor. 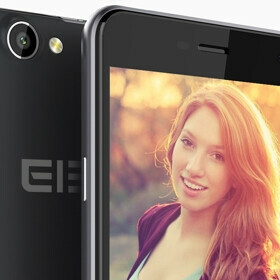 Elephone expects to launch the P5000 in January 2015, for a price that hasn’t been announced. International orders will likely be available. Interested? Droid turbo has a new competitor..
And you really believe it??! Nokia 3310 has a new competitor. Depending on price, this looks like a nice alternative to the Huawai Ascend Mate 2. Woah, 70% in one hour!? Well, we don't know what the time is for the rest of the battery; for all we know, the total charge time could be way more. The Highscreen Boost 2 SE has a version with a 6000mah battery, but it is pretty thick. So watching 150min of Movie(s) is either 2% or 4% depending on how you read the chart? Sounds legit. The design. It's like iPhone 6+ and Samsung S4 made love. The Elephant 5000, that's a phone I want to buy! I don't get how random Chinese companies can make insane phones with crazy tech, and they look alrite too, even their skins aren't that bad, most also come with custom recoveries pre installed and cost ~500.. while the main OEM's like Sony, HTC etc.. make crappier phones with larger bezels and more bloatware every year. What the heck is going on. How hard is it for Sony to make a large capacity phone with small bezel's, fingerprint scanning and stock Android 5? Yes, the battery is excellent, screen also but you are forgetting one big thing: The phone supports 2G GSM: 850 / 900 / 1800 / 1900 MHz 3G WCDMA: 900 / 1900 / 2100 MHz It means that you cannot use European 3G service! In other words, forget about reading emails or surfing, it will be awfully slow.